Two things have come to my mind this conference weekend, two things that I have heard Pres. 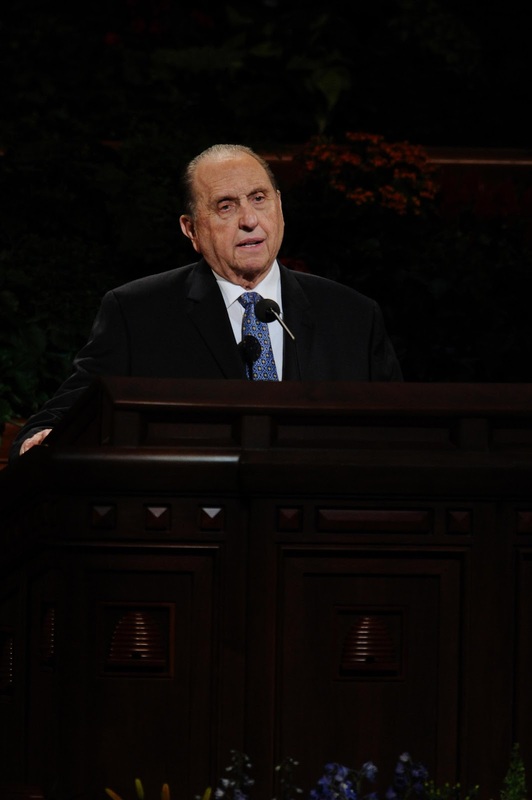 Monson say a number of times in the past—things that you have probably heard, too—but that I am seeing in a different light now. We all like to be right and to avoid admitting we are wrong, especially when we are communicating with our spouses. That is natural, of course, but the “natural man” (Mosiah 3:19) is what gets us into trouble. So, following the Prophet’s counsel, we can be right in everything we say—as long as we follow the commandments of the Lord! Sorry. I don’t mean to be light-minded about this, but I believe this is true with all my heart. The main key for me in my communication in the home has been to recognize the most important need, that is, not to be right, but to have the Spirit of the Lord with me. If I do or say anything to get our family off track from that high goal, I can’t feel right or be right, no matter how hard I try. One of the most haunting verses of scripture to me about contention or angry communication is something the Savior said right after His arrival in the New World, apparently right after His resurrection—it must have been important! “For verily, verily I say unto you, he that hath the spirit of contention is not of me, but is of the devil, who is the father of contention, and he stirreth up the hearts of men to contend with anger, one with another. Behold, this is not my doctrine, to stir up the hearts of men with anger, one against another; but this is my doctrine, that such things should be done away” (3 Nephi 11:29–30). When I have realized in the past when I had a contentious spirit that I actually had the spirit of the devil in my heart, that is not very heartening. But I have been guilty of this too often. I find then that I have had to just turn away from contentious feelings and cast Satan’s influence away. When I adjust my thoughts and come back to the conversation, then I can do so with calm and loving feelings. I think the main thing I have realized over the years is that the negative things or feelings I have expressed in the past can and should be communicated in a positive way. We can deal with the very same issues, but instead of doing so in a negative way, we can do it in a positive way, with affirming and uplifting language. I think we all need to find a way to fully express ourselves, but we can do so without shutting down our communication or relationships. In other words, you can deal with the very same issue but get much better results without creating resentment in the other person by taking a positive, loving approach. It is like so many things in this world that can be negative or positive, like TV or the Internet or money or the way we communicate or relationships between men and women or anything. It is not that TV, for example, is only bad or only good. It can been negative or positive depending on the approach we take to it, depending on what is in our hearts, and what our true intent is, and how we use it. “Therefore, why is it that ye cannot understand and know, that he that receiveth the word by the Spirit of truth receiveth it as it is [spoken] by the Spirit of truth? Wherefore, he that [speaketh] and he that receiveth, understand one another, and both are edified and rejoice together. And that which doth not edify is not of God, and is darkness. That which is of God is light; and he that receiveth light, and continueth in God, receiveth more light; and that light groweth brighter and brighter until the perfect day” (D&C 50:21-24). If I am not building up, I am tearing down, and if I am tearing down, I am in darkness where the devil and his angels reign. If I am building up, I am in the light and God is with me. And that’s what I want more than anything! One of the best ways that I have found to minimize contention in our family is simply to have family scripture study daily. It seems to help us keep more of the spirit in our lives. My little girls get up each morning willingly and happily to read the scriptures. They would never dream of letting us forget. This is our second continuous year of following that council and the most important change I have seen is the desire to argue and bicker has decreased and the love and appreciation have increased. I have found great love and understanding through reading my scriptures.